After Michael's Triangle Tavern near the Y in Zion closed its doors in 2016 following 34 years in business, the restaurant sat empty for more than two years. Now, what was originally built in the 1800s as a farmhouse is buzzing with diners once again as Old Farmhouse Eatery serves up comfort food with a flair. In the not-too-distant future, it will add a microbrewery as well. 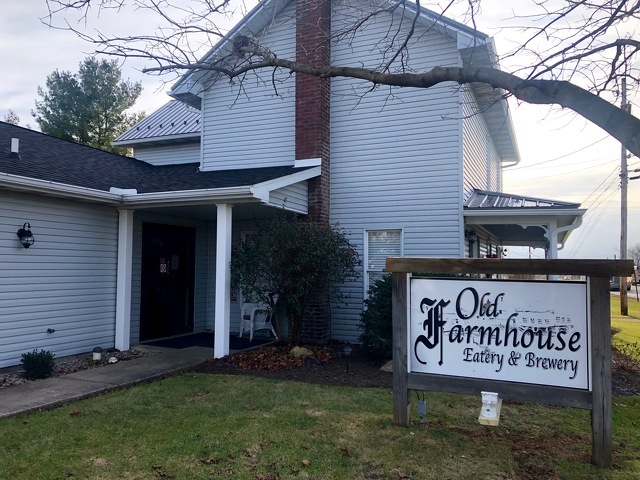 Co-owner Dave Faussette, who purchased the property and owns the new restaurant with his parents Dave Sr. and Michelle, said the after a soft opening the weekend of Nov. 23 and a grand opening last weekend, Old Farmhouse has been warmly received. They had a full house for lunch and dinner this past Friday and Saturday and business has been steady since the soft opening. "The locals are seeming to enjoy it," said Faussette. "We have great conversations. A lot of people are being very kind and offering original pictures of the farmhouse that was built before the land was renovated and modernized around it. That’s been cool, so they’re going to be bringing us some prints and we’re going to be putting those up… We’re kind of giving the locals an opportunity to decorate with a vintage feel of the Zion and Bellefonte area." From the menu of appetizers, salads, sandwiches, wraps, entrees and desserts to the layout and fixtures to the staff, Faussette said he wants the family-owned restaurant to have an appropriately family atmosphere. "The biggest thing we’re focusing on is a family atmosphere," he said. "We sit there and chat with everybody. We’re very comfortable people and very outgoing and we’re just enjoying the idea of being able to talk to people all day." Family is, after all, the key reason why Old Farmhouse Eatery exists. Faussette, a State College area resident and multi-degree Penn State grad, had long dreamed of owning a restaurant while working for years in food service. He built up his business chops as owner of Ikonic Ink tattoo and piercing studio, which has locations in State College, Indiana, Florida, Louisiana and an online shop. His parents live in Pleasant Gap, meanwhile, and had driven past the for sale sign in front of Michael's on numerous occasions. When Dave Sr. retired, he was looking for an investment opportunity and something where he would have fun. The Faussettes closed on the sale closed in July. "The old farmhouse feel was more us than being in downtown State College and the hustle and bustle," he said. "We wanted something on the outskirts we could really make our own." Renovations centered on the farmhouse theme, keeping it both rustic and modern. They added barn-wood tables, gray hardwood floors, a and new rustic-style bar with a granite countertop. But they also kept a number of classic touches, like the loft and interior balcony and wooden and brass rails. Faussette said he wanted to start slow and keep the menu "basic," but even the basic foods come with interesting twists, culled from different parts of the country. The cheesesteak sandwich, fish sandwich (haddock with remoulade) and a blackened prime rib wrap (picked up by Faussette in Tennessee) have been among the most popular offerings so far. Salads come in the mixed greens variety, but the Caesar uses grilled romaine and the Silo Tower uses grilled iceberg, searing halves of lettuce to give them a crispness and a bit of the flavor of the grill. Faussette is one of two head cooks in the Old Farmhouse kitchen, along with a veteran of State College restaurants. He worked with a chef from Arizona to develop the menu and a bit of the West Coast shows up in items like the Double Stack burger. Faussette also worked with chef friends from Chicago, Maryland and in State College to kick around ideas for the menu, which features a variety of other burgers using ground brisket and short ribs (black bean burgers or chicken can be substituted), wraps and sandwiches, as well as entrees like Gocce pasta, honey bourbon grilled chicken, sirloin and more. And there are starters such as wings, stuffed crab shells and house-made burrata. "It gives people a different side of comfort food," he said. While the menu grows, so will the property. The Faussettes next plan to build the microbrewery in the back of the building. Currently it's waiting on minor land development approval, followed by a building permit. Fausette hopes construction will get started in about four months, then it will take about four weeks to get the first brews out. While Faussette has his own homebrew experience, longtime brewer Scott Chapman, of Bellefonte, will be head brewmaster. "He’s got an amazing saison and his ales are awesome, so I think people will really dig the flair he puts on his beers," he said. But the focus remains on building the family atmosphere. While Dave Jr. works the back of the house, Dave Sr. and Michelle work the front, chatting up their new patrons. There's a fireplace for a cozy atmosphere, a kids corner and Faussette is planning to have a regular Saturday night acoustic performer. "We’ve been getting very good reviews on Google and social media. People seem to like the food, the atmosphere. We have a very friendly wait staff," he said. "My parents go around talking to everyone at the tables, checking in on them and keeping that comfort level where everybody feels welcome... We’re just trying to enjoy it and have fun with it." Old Farmhouse Eatery, 226 Nittany Valley Drive, Bellefonte, is open from 11:30 a.m. to 9 p.m. Tuesday through Sunday. Faussette said he expects to be open a bit later on weekends after the microbrewery opens. Check out the restaurant's Facebook page for more information. A public meeting on Thursday (Dec. 6) will offer discussion and a chance for final public input on the feasibility study for a potential Bellefonte to Milesburg greenway trail.